I spent the past ten days traveling within Europe. I jam packed my itinerary so that I could fit in all the museums I wanted to see and also take a full day trip to the medieval city of Bruges, known for chocolate and lace. Aggressive planning aside, whenever I take a trip like this where I explore a new city, I find myself returning home with renewed energy for hobbies, life goals, and the present moment. This time around, I found myself pondering why exactly that is. I live in New York City, a mecca of culture, art, music, and restaurants available all day, everyday. I regularly take advantage of these things, but on my most recent European adventure, I started asking myself – why when I am in a foreign country do I have joie de vivre to go to that one extra museum and see that one last exhibit? And why do I not extend that same energy to all that I do in my daily life? The answer is simple. Because when I am on vacation I am fully aware of and engaged in the present moment. I know I only have a set number of days to experience all the great things about these cities. Sure, I could come back, but with a bucket list burgeoning with cities across the world, I always wonder, when exactly that will be. So I recognize that I have the time and the spirit now and I go for it. On this past trip, I spent about four days in Amsterdam. The weather was frigid. Much colder than it normally is this time of year and winds gusting up to 40 mph. In New York when it’s that cold out, I take solace in the hygge-inducing warmth of my apartment with its comfortable sofa and binge-worthy Netflix. 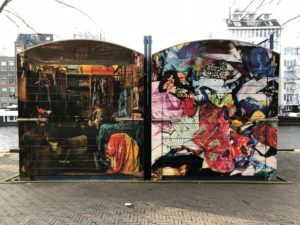 But in Amsterdam, I had an overflowing list of museums to see (including one with a Banksy exhibit), food to try (have you ever had a Dutch savory pancake? Delicious! ), photographs to take (the frozen canals are an experience unto themselves), and of course things to buy (I was not going to let the trip pass without a visit to the artsy Nine Streets area). I made it to every museum and art exhibit on my list (with a couple of extra to boot), had a relaxing massage, explored many of the main shopping districts, and sampled some of Amsterdam’s gastronomic hot spots. Every day I made it a point to prioritize sleep. I ensured I had time at the end of each day to unwind, watch a movie, and reflect on the day, making sure to get in at least eight hours of sleep. The next morning, I fueled the day with a solid breakfast and set out on my way. I turned off my cell phone and only used it for taking pictures and when I needed Google Maps! I fully engaged in every painting I saw, canal bridge I photographed, and meal I ate. I left Amsterdam a bit tired, but completely renewed from my experiences. I plan to extend my tourist mindset more regularly to my daily life. Approaching every day as an opportunity and not as an excuse to put off the things that excite and matter most to me. There is a common misconception for those new to meditating that mindfulness can only be achieved by sitting on a cushion, closed-eyed, and focusing intently on the breath. If you read last week’s post, you have probably started to understand that the ability to bring mindfulness to what we do is cultivated on the cushion, but the opportunities to practice it and therefore fully engage with our world and our lives, are boundless. Travel is a good reminder of how we can disconnect from the noise of the world and reconnect with what truly moves us. This entry was posted in meditated, travel and tagged meditation, mindfulness, travel, yoga.